Ritter instruments are absolutely stunning, both the guitars and basses. With some boutique instruments you can struggle to see how they justify the asking price. Ritters look like they should cost at least as much as they do. I love stuff like this. I wonder if anyone could tell the cardboard strat from a wooden one in a blind sound test? That first track was sounded like a lost Iron Maiden tune. 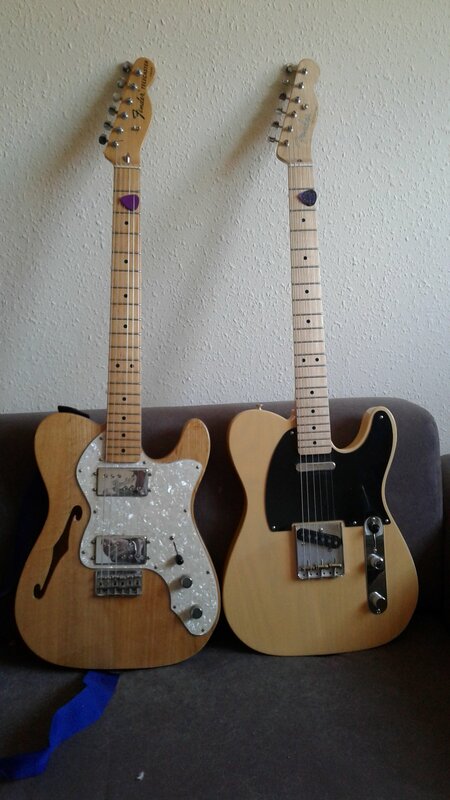 I really like the look of that, but I generally like anything tele shaped especially with a natural finish. The P90s are an added bonus. Would I buy one? Probably not. 'Eco friendly' suggests bio-degradable and I 'm firmly of the school that believes that a well looked after guitar should, with proper maintenence, last at least a couple of lifetimes. I've not seen one in the flesh, but from the pictures and video demos the bridge doesn't look like it's adjustable. Although I can't say for certain one way or the other. Fender's new 'Acoustasonic'. There's quite a gushing article about it here https://www.wired.co.uk/article/fender-acoustasonic-guitar Parts of which I suspect have been cut and pasted directly from Fender's own press release. It seems to be a sort of acoustic focused variant of the Line 6 Variax concept with several acoustic 'voices' and some solid bodied electric ones all available on one instrument with the promise of none of the feedback issues sometimes associated with putting an acoustic through an overdriven rig or pedals. Personally I like the aesthetics but I'd to have to be really impressed with it before I decided that I really needed to own such a thing. I bought myself a Katana 100 212 as an early Christmas present. It is a great amp for the money, I particularly like the fact that there's a headphone jack and that it can run on 0.5, 50 or 100 watts so it really can do both home practice and decent sized venues. As for the 'easily accessible tones', I'm finding there's a bit more of a learning curve involved than some online reviews imply, particularly with the effects section. I need to spend some time with the amp connected up to the PC with the Tone Studio software to really get a handle on what it might be capable of. Lost picks? I wouldn't know This is my 20+ year old Dunlop tortex pick (on the right) next to the same make and model bought a few months ago. Either they used to make them slightly smaller with a different shape or the older one has lost a couple of mm in height and width over the years. The old one is noticeably slippier as well. I think I must have knocked most of the tortex out of it. I presume that you'll be reversing engineering this to incorparate the best features into your own designs? Seriously though, that's a very nice looking , and (judging by the video) sounding guitar. Sounds like you've got it covered in terms of guitars and effects. Best of luck. I've been thinking about this, and I keep ending up with a Telecaster very similar to the Baja I already own. It's not the extra pickup/s switch options, to be honest I rarely use those, I think it's the soft V profile neck that makes it so comfortable for me to play. So I suppose I'd go for a soft V profile neck Tele with upgraded pickups, maybe Texas Specials, and top of the range hardware. Probably a natural finish with absolutely no relicing. Considering all the possibilities of an imaginary custom build I'm a bit disappointed in how run of the mill my 'ideal' guitar actually is. The coil taps are a major plus point for me. I think the reservations from the purists are rooted in the Gibson vs Fender/humbuckers vs single coils school of thought. But for the rest of us, if you can have both on one guitar, why wouldn't you?